Is it possible that, even with all the advances in safety awareness, training programs, regulations, and the like, that we have not yet substantially changed the behaviors associated with the Top 10 OSHA violations? Those of us who have been in the safety business for more than 20 years know the answer. 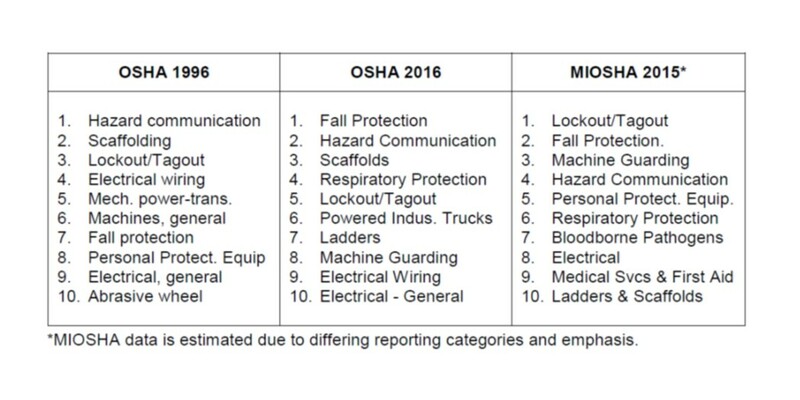 To illustrate the answer, let’s look at the Top 10 Violations List from 1996 (OSHA) and compare it to today - 2016 (OSHA & MIOSHA). See anything different? I’d say, not much. We know that OSHA has implemented Emphasis Programs that focus on specific topics over the years, and this helps jockey the top 10 violations into different positions and sometimes replaces them in certain years. But even with OSHA’s emphasis, the topics that comprise the Top 10 Violations List stay generally consistent from year to year. However, there is hope. I challenge all of the safety managers out there to make a resolution for 2017 - to make it a goal for your safety programs to mitigate and eliminate the Top 10 violations from your operations. OSHA believes, and I think we can all agree, that if employers mitigate the hazards concerning just these Top 10 Violations, that injuries and fatalities would be significantly reduced. So how do busy EHS professionals accomplish something like this? One option would be to have facility personnel help you review your programs. Ask the safety committee to review and provide comments on your HazCom Program. Are all facility hazards included in the Program? Similarly, you could have your maintenance manager review your LOTO Program. Do you have an equipment-specific procedure for each piece of equipment in your operation? Another option is to hire a consultant to help you. Is your PSM Program still current? Does your Emergency Response Plan still reflect what you will actually do now? Do your programs have too much regulatory language in them and not enough facility information? Can procedures be simplified and made more user-friendly? Either way you go, a “fresh set” of eyes will be helpful in spotting missing or outdated information or in identifying facility safety issues not previously noticed. You can find the OSHA top 10 most frequently cited violations here. You can find the MIOSHA top 10 most frequently cited violations here.